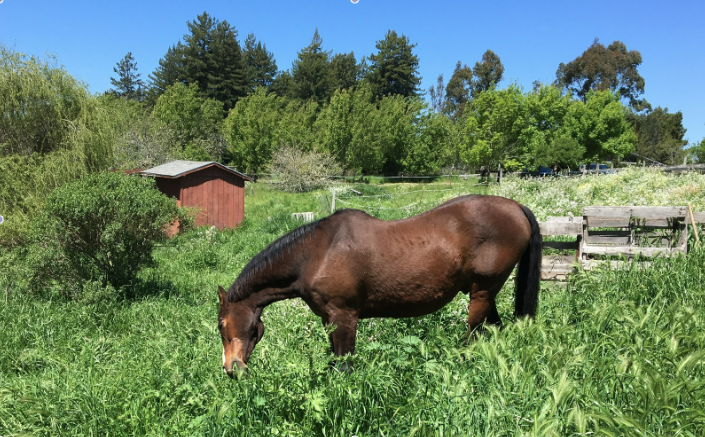 Icssoma Farm in Sonoma County,Northern California, is where Susan Jan has run her all-volunteer horse rescue since 2008. I ﬁrst started rescuing horses in the early 90’s when I was working full time as a riding instructor and horse trainer. A friend and fellow trainer told me about “killer yards.” These are the holding pens where horses have their last chance of being purchased before going to auction. Being sold at auction is almost always a death penalty for horses, as they are usually purchased for slaughter. I started buying one to three horses each year from these auctions, and would rehabilitate them, train them and then sell them to loving homes. If I was lucky enough to make money, or even break even, I would be able to buy another horse. My goal was to find promising horses and give them a new life. In 2005, horse slaughter was banned in the U.S., which most people thought was a humane step. In reality, this ban created a heartless and terrifying outcome for the tens of thousands of horses that are discarded each year. They are purchased by meat buyers for a few hundred dollars, packed into trucks with no feed or water, shipped to Mexico, and brutally murdered under conditions too horrible to discuss here. This transport and execution reminded me of Auschwitz, and the immorality of torture drove me forward. As I continued my aspiration of saving horses, a model for a rescue began to develop. I wanted to include others in my goal of becoming an essential part of saving the lives of these magniﬁcent beings. I began ﬁnding volunteers, and slowly my efforts became focused on training and educating the people who were drawn to the work of rescue and rehabilitation of horses, and of ﬁnding forever homes for them. Each horse saved, and every person educated, was a victory. After several years of rescuing, and working with volunteers, I began to notice a pattern. Many of the people who were drawn to the rescue were themselves looking for a way to heal from loss and sorrow in their own lives. Some had lost partners and friends, some were dealing with depression or recovering from addiction, some had themselves suffered abuse, and some had lost homes or were healing from illness. 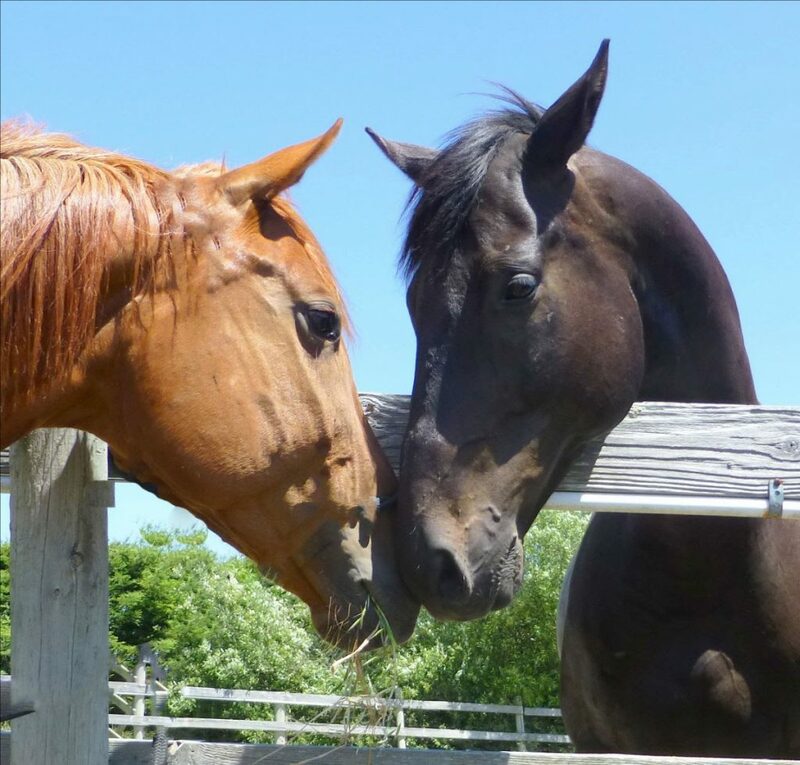 All were discovering ways to heal through the hard physical and mental effort of working with powerful and sensitive horses, through the community and friendships they found at the rescue, and even through the experience of spending several hours each week in the beautiful natural surroundings of the farm. It seemed that after a year or two of volunteering, many people were past their grieving, or had at least found a new way of dealing with their pain, and were ready to move on with their lives, as they had helped horses move to a new life and a hopeful and secure future. In retrospect, it seems obvious— healing others is a wonderful way to put aside one’s own pain, and experiencing the beauty, hope and even hard physical work necessary to heal and retrain a horse redirects energy away from oneself. Volunteers form close bonds with one or more favorite horses. Some have even adopted a horse they had helped to rehabilitate! Everyone, myself as well as the volunteers, becomes attached to each horse we work with, and success in ﬁnding that perfect home for each horse can be a bittersweet experience. But then we ﬁnd another suffering equine soul who needs saving, we meet new human friends who are looking for their own healing, and the work goes on. And this is what keeps me going, what gets me up each morning – helping to heal horses and people. You can learn more about Susan Jan’s work and watch a nine minute YouTube presentation at this link.